As we come to the year’s end and the final Design Challenge of 2018, we look forward to the Founders’ Choice Awards which is a time for GCU to look back on all of the amazing card submission of 2018. GCU runs the Design Challenge every month with each challenge having a different theme. 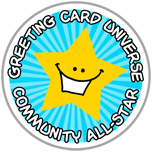 It is a great source of new card designs for GCU, a fun opportunity for artists to challenge themselves and design outside of their norm, and inspiration for artists looking for new ideas. Heading into 2019, GCU would love to see more artists enter the challenge each month as well as see more artists enter for the first time. We’d like to get artists’ feedback and suggestions on how to improve the Design Challenges for 2019. How can GCU make the challenges more interesting, easier to enter? Would you like more time, better rewards, input on themes, better communications or reminders to enter, etc.? By 12/15, please share your feedback in the comments / reply below or if you’d like to send them privately please send an email titled “Design Challenge Feedback” to mindy@greetingcarduniverse.com. Last call for feedback on Design Challenge changes for 2019. Thank you!